FOR IMMEDIATE RELEASE CLASSIC PULP HERO SOARS WITH SOUND! THE NEW ADVENTURES OF THE EAGLE VOLUME ONE DEBUTS IN AUDIO! From Japan to Berlin, from Paris to Moscow, from London to Washington D.C. and all points between and beyond, The Eagle’s reputation for facing the most dangerous opponents, taking on the most difficult missions is well known. 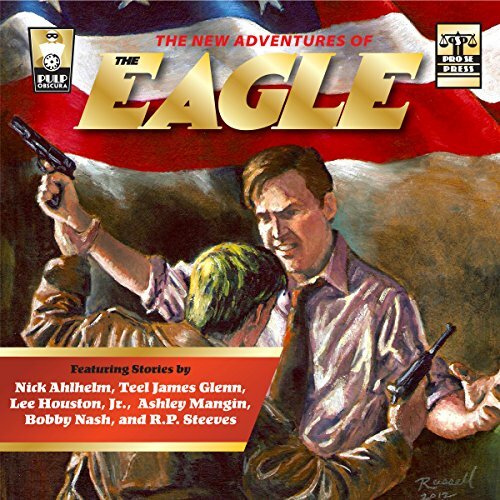 And now he flies again in THE NEW ADVENTURES OF THE EAGLE, a top quality audiobook produced by Radio Archives! Jeff Shannon is The Eagle- America's Ultimate Secret Agent! The Eagle's Mission: To Wage a One Man War Against America's Enemies and those Who Threaten Liberty Across The Globe! From Out of the Past Comes New Tales of One of Pulp's Forgotten Heroes! Bringing Adventures and Heroes Lost in Yesterday Blazing to Life in New Pulp Tales Today! Thrill to Six Sensational Tales of High Powered Adventure, Heart Stopping Thrills, and Death Defying Action from Nick Ahlhelm, Teel James Glenn, Lee Houston, Jr., Ashley Mangin, Bobby Nash, and R. P. Steeves! Join Jeff Shannon as he fights against the foes of freedom in fantastic new adventures! This exciting New Pulp audio book is also available on Audible and Itunes. THE NEW ADVENTURES OF THE EAGLE VOLUME ONE is available at Amazon and www.prose-press.com. BLOOD-PRICE OF THE MISSIONARY’S GOLD: THE NEW ADVENTURES OF ARMLESS O’NEIL NOW ON AUDIO!